This painting by Joan Baez celebrates the courage, commitment, and articulateness of Emma Gonzalez of Margery Stoneman Douglas High School. It also reminds me of so many bright and beautiful students I have taught in public high schools. Their names and faces flash before me. I thank Emma Gonzalez and my students for who they have become. I am grateful for the privilege of having been a teacher. THAT IS WHY WE TEACH. Finally! These Are What I Call Standards. They didn’t know how to sew. They didn’t know how to code. They didn’t know how to solder. And they had never used a 3-D printer before. 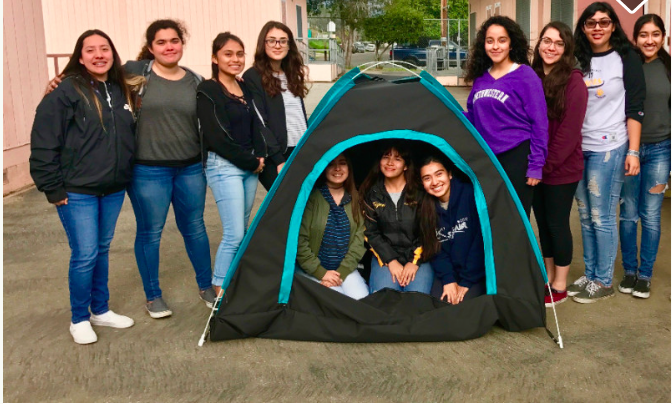 But 12 girls at San Fernando High School taught themselves all these skills — and more — to create a solar-powered tent for homeless people. “You’re learning new things you’ve never even heard of or even thought of,” Chelly Chavez, a student on the team who learned coding languages for the tent’s technical aspects, told Mashable. Amazing! These girls created a way to address the problem of homelessness in their community. These girls will inspire other girls to take on challenges in the sciences. These girls demonstrate what real national standards for learning should be. Being informed about societal, political, and environmental needs. These are the standards with the power to make students into learners and thinkers. These are the standards worth insisting upon. These are the standards that will transform the world. How can it be that children born in a certain month are much more likely to be diagnosed with ADHD than other children? Was it the weather in the month of their birth? Was it their astrological sign? Was it just bad luck? And why did it happen in only some states and not in others? The answer lies in knowing the kids. In a study, released in November 2018, Harvard Medical School researchers examined data from 18 states in which children who turn five by September 1 are enrolled in kindergarten. Children, therefore, born in August are almost a year younger than their classmates who were born the previous September. The study concluded that a significant number of August babies were being diagnosed with ADHD and put on medication for it simply because they were younger than their classmates. The results, published in the New England Journal of Medicine, showed that students born in August had a 34 percent higher rate of ADHD diagnosis than their older classmates born in September. Essentially, that means the youngest children in school are more likely to be diagnosed with ADHD. Furthermore, younger students are more prone to receiving longer, more intensive medical treatments for ADHD than older classmates. That especially surprised the study’s main author, Timothy Layton, an assistant professor of Health Care Policy at Harvard Medical School. According to a 2016 CDC report, nearly one in 10 children between 2 and 17 years of age — over 6.1 million total — have been diagnosed with ADHD across the nation. And the rates of ADHD diagnosis have increased by more than 40 percent over the past two decades. But Layton believes normal maturity differences between younger students versus their older classmates are being overlooked as a factor in ADHD diagnoses, especially among young students. Layton hoped this data will encourage doctors, parents and teachers to view child behaviors with more context. This is a serious situation for those August babies who are being misdiagnosed with ADHD and put on intense medication for their childhood years. It is also a serious situation for all children who are younger than others in their grade if they are being judged by behavioral and intellectual standards for children a year older than they are. The younger students can develop a negative self-image as learners and thinkers if they are made to feel less adequate than their older classmates who can sit still longer and have greater focus than they do. One size does not fit all. Context matters. And for children in the beginning years of school, age is a vital part of their context. Recognizing that as parents and educators is our job.